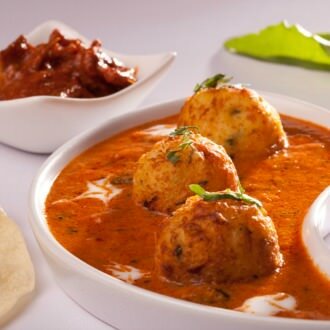 Kashmiri Dum Aloo a mildly spicy and tasty whole potato curry &cooked with healthy yogurt and tomato base. First, you boil the potatoes, peel them after that prick each potato with fork 3-4 time this helps in making the potatoes tender faster and helps in absorbing all spice. Heat 3-4 tablespoon oil in a heavy bottom sauce pan then add potatoes and fry them until a bit crispy (little orangish red ). Then you can discard half of the oil from pan and add onion ginger garlic paste sauté until onion start to turn soft but it should not change color. Put cashew paste and sauté it for 2 minutes after that put tomato puree and let all spice cook for the 4-5 minute until oil is shown separate from the paste, reduce heat add yogurt cook another five-minute until its start to show oil separately. Add fried potatoes with one cup of water mix well and cook for five more minutes. After that remove the pan from stove and garnish with cilantro & green chili. Serve with naan or rice.